Mostly low to medium stake players. Everest Poker is a promising online poker room and has become even more popular recently due to additional promotions . It is not a large poker room such as Party Poker or PokerRoom, but it delivers more than the average room does and offers an interesting loyalty program called Summit Points. The software is very good although only Texas Hold’em is supported. On the other hand, you get a fast-claimed sign up bonus worth $500 and very soft competition. At first, we had a few raised eyebrows about the software of Everest Poker. It is not the typical kind you’ll find with a table seen straight from above. Instead, it is presented from a 3D perspective with realistically looking characters. We particularly like the fact that you can switch the observer viewpoint of this table. 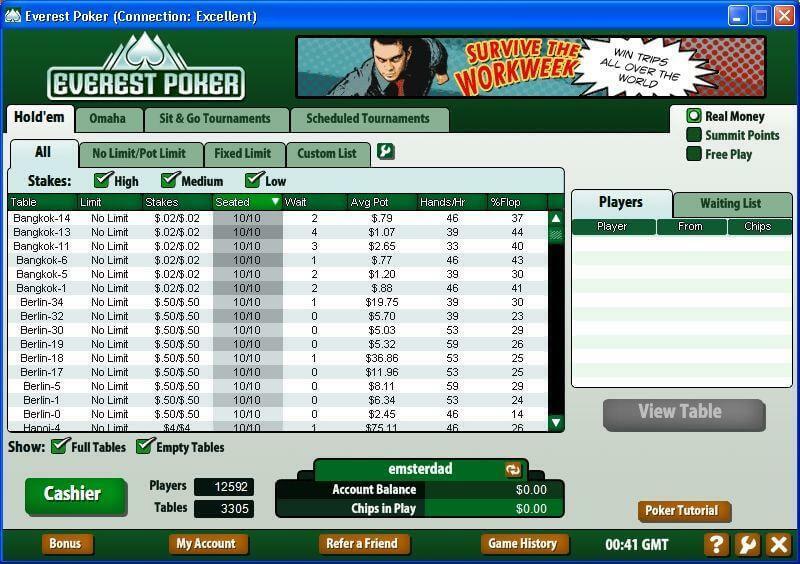 Everest Poker also features a superb lobby, which kind of reminds us of the old Bridge software we had a few years ago. Nevertheless, this lobby has all the filters you will ever need to find the table of your needs. Roughly 4,000 players join the Everest Poker network during peak hours. It is not a large number compared to the largest poker rooms, but such a number is still significant enough to provide for plenty of action. Only one quarter of these players reside in ring games, which is a low figure compared to other portals. Everest Poker offers a fairly comprehensive list of single and multi table tournaments. The multi tables in particular host guaranteed cash games ranging from $1,000 and up to $5,000, but you can also chase your competition in satellites to the European Poker Tour. Buy-in fees vary from $1 to hundreds of Dollars, although the high stake tournaments aren’t so common. Sit’n’Go tables are usually in the $50 limits and although there is competition at $500 too, these tables require some more time before people join. Omaha and 7 Card Stud players will have to look elsewhere. 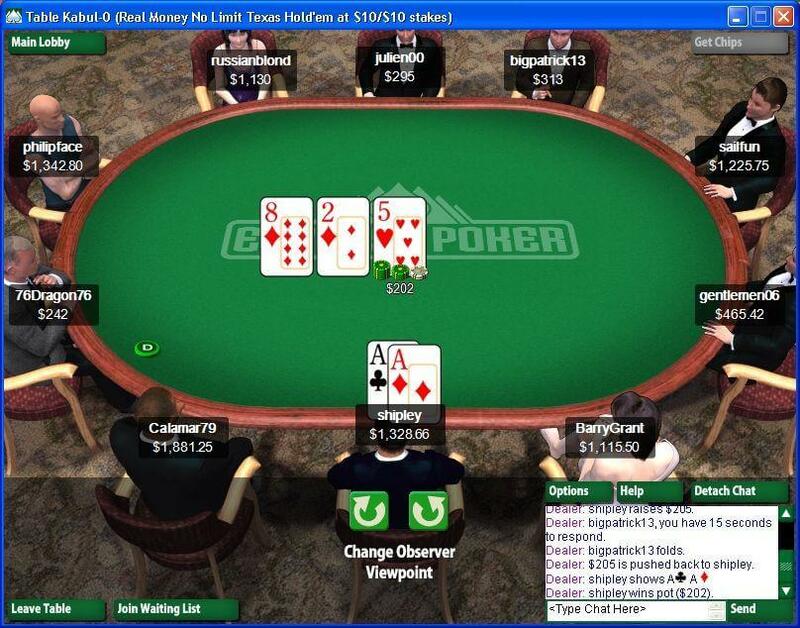 Everest Poker is one of very few poker portals to support Texas Hold’em and nothing else. This is certainly not a big blow to most players since the vast majority is into Hold’em games, but it wouldn’t be so bad to relax with Omaha once in a while. Everest Poker features very loose play at most of the tables. Some No Limit $10 rooms offer play with 60 percent viewed flops, which is a very high figure. Most of the competition is concentrated to low stakes and medium stakes, however, so for that reason, you are likely to find a lot of fish here. As a new member of Everest Poker, you get a $100 bonus regardless of the size of your first deposit. EveryPoker.com visitors are however offered another free $400 added on top of the $100. This accounts for a total of $500 in free cash. Simply use the Everest Poker bonus code free500 to cash in the bucks. In addition, this bonus is fairly simple to claim if you play at $1/$2 stakes or higher. 1) Clear any previous Everest Poker cookies. 2) Download and register an account at Everest Poker. 3) Enter bonus code free500 within 7 days of registration. Everest poker has taken some very interesting steps to implement a unique loyalty bonus system. The basic idea is identical to what most of the other poker portals provide, but there are some differences. First and foremost, the two first players at the table earn so called Summit Points at a double rate throughout the game. These points can then be redeemed into special Everest Poker merchandise, real money tournaments and even special Summit Point tables, where you gamble with summit points against other people’s points. Everest Poker is not focusing primarily on heavy promotions, but the ones that do exist are covered under the Loyalty Bonus section and the Tournaments section. A sturdy $500 welcome bonus, freerolls, a Summit Point program and European Poker Tour satellites are the best promoted features. Only e-mail support is available. It is fast, reliable and available in multiple languages. Deposits: Neteller, FirePay, Click2Pay, Visa, MasterCard, ECO, Moneybookers and PaySafe Card. Cash-outs: Neteller and wire transfer.